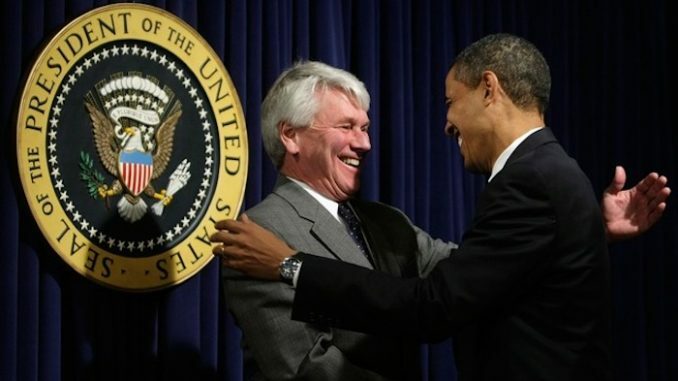 Prosecutors are preparing to indict Obama White House Counsel Greg Craig for failing to register as a lobbyist for Ukraine. According to a bombshell CNN report, the D.C. U.S. Attorney’s office and the national security division of the Justice Department are now considering charging Craig with false statements, and are pushing Craig to take a plea deal. Talkingpointsmemo.com reports: The alleged false statements reportedly have to do with claims Craig made to the Justice Department about his communications with journalists about a report his firm compiled as part of its Ukraine work. The project to write the report was passed to Craig’s firm by Paul Manafort. Prosecutors were initially investigating whether Craig violated the Foreign Agents Registration Act by failing to register as a lobbyist for Ukraine, a charge initially faced by Manafort as well. Craig, according to CNN, has denied that the communications amounted to outreach on behalf of Ukraine, and instead has claimed he was working against Ukraine’s interests by urging reporters to characterize the report in question as one unfavorable to the country. The report — assembled by Craig’s firm at the time, Skadden Arps — was an examination of the prosecution of Yulia Tymoshenko, a political rival of the pro-Russian party then in charge of the country. It was pitched as an independent review of Tymoshenko’s case, but in fact was done on behalf of Ukrainian Ministry of Justice — a collaboration fostered by Manafort as part of his consulting work for the pro-Russia party, the Party of Regions. Prosecutors, when Craig’s case was still in New York, weighed charging Craig with a violation of FARA, and even got Craig’s lawyers to agree to an extension of the statue of limitations in the law, according to the CNN report. While the case was still in New York, Craig’s legal team made several presentations in front of the U.S. Attorney, per CNN. They argued that prosecutors were driven by the political climate around Justice Department investigations into conservatives that made it appealing to prosecute a prominent Democrat, according to CNN. The prosecutors in New York ultimately concluded that they did not have enough evidence, according to CNN, and sent the case D.C. There, the prosecutors are looking at bringing the false statement charges, as the extension on the FARA statute of limitations has expired, according to the report.